The Givi AIRFLOW Windscreen features a large adjustable spoiler for fine tuning the deflection of wind. The Givi Universal Airflow mounts to your handlebar using an included fit kit. Height is infinitely adjustable along a path of 12cm (4.7"). Maximum height at full extension is 52.8cm (20.9"). Upper portion is detachable for increased airflow during warmer months. I ride a little 250 Nighthawk, and prior to buying the Givi I had a spitfire windscreen, which blocked wind to my chest but not my head. It was a noisy ride and strained my neck. The Givi windscreen cost twice as much but works 10 times better. I had to fiddle a bit to get the angle right, but it has made for a super quiet and easy ride. Absolutely love it. I have a number of Givi products and have been satisfied with how they mount, look and work. Not the case with the AF-49 windscreen. In spite of it's name, this is not a "Universal" product. The mounting system uses a 4-point method with two clamps fitted around the upper end of the fork tubes, and a second set of mounts fitted on the handlebars in-board from the clutch/brake perch assemblies. But......as others have noted, the supplied clamps for the fork tubes are very small in diameter, really too small for most modern bikes. The clamps are simple stainless steel screw-type hose clamps as you would use on a radiator hose under the hood of your pickup, but in addition to being small they are also ugly, not exactly what I would expect from Givi (known for and very proud of their styling). The other problem is that the bar clamps provided for the handle bars are only suited for old-school straight tube 3/4" handlebars. And Givi does not have an optional clamp set available for tapered bars or larger diameter bars. Too bad as the windscreen itself looks well thought out and well made, but the shoddy mounting system limits the bikes the windscreen can be used on, and will not look elegant on the bikes it can be fitted to. I just installed an Airflow Universal on my 98 Honda Magna. The install required some fiddling, but otherwise went ok. The big problem is the poor performance. I'm getting severe turbulence and noise around my helmet. Even when adjusted to high-eye level, the air is not being directed over me, but rather into my head. The shield is tilted back about 35 degrees from vertical. I will experiment with different configurations, but so far this is a fail. The results I'm getting now are worse than having no shield at all. So far I'm loving it, it does a good job of keeping the wind off of me, too good around town, I actually have to leave my visor open a notch to keep it clear. On the highway I'm still working out the best position, in the meantime if it's EXTREMELY cold I go into a slight tuck and almost no wind gets to me. It did take a bit of time to mount it properly, so it couldn't hit my tank. I mounted it coming of the front of the forks, as opposed to back or side. I am going to find a quality clamp for it though, the hose clamp used for the bottom mount detracts from the looks of my Moto Guzzi Breva 1100, can't have that, it's a beautiful bike. That is my sole problem with this screen. Other than the ugly clamp it's AWESOME!! I installed this on my husky strada 650. This is the best wind protection for an adventure touring bike. I did run into an install problem as the two clamps for the fork tubes were too small. I had to buy new ones at the local ace hardware to finish the install. Great wind sheild and the rest of the install was smooth. The cost was much more than others but the added features were worth it. I installed this on my 1981 Honda CB750K and it works great. My 81 Honda CB750K is now a sport tourer. I added the hard leather bags and tour pack from my Harley Davidson Fatboy. I just totaled it a few weeks ago. I have to wait until I get the insurance check and I am going to replace it with a 2013 Honda F6B. That will be my new 850 lb sport bike. You should try a test ride you will be hooked. Bought this last summer for my Vulcan S deflects the wind perfectly and is highly adjustable. Any configuration you want it can be achieved. Worth every penny. This is the best thing I ever bought for my 1981 Honda CB750K and it bolts up with no mods. Need for new Ural Sahara! Does anyone have experience on this windshield with BMW R nine t? Do I need an extra kit? Can I assembly this windscreen ( Givi AF 49 ) in a BMW R 1150 R? BEST ANSWER: The airflow I have is specific to a Suzuki V-Strom, but, yes, you can remove the extension by loosening the clamps and sliding it out from the top. I would assume the Universal fit screen would be the same basic design. Yes, it is removable. In fact, you put the two pieces together when they come to you. It's handy when cleaning bug guts off of the plastic. Will the AF49 work on a Moto Guzzi V7 III Stone? Any issues with fitting it to the bike? I own a BMW K1200Lt (2005) with lower windshield (not original). Which of Givi Airflow suits my bike? BEST ANSWER: I don't know about your bike but I bought the Universal Givi Airflow for my 1981 Honda CB750K on faith and it fits great. The kit is very universal and would most likely fit a lot of bikes. I love it!!! It is one of the best things I have ever bought for the bike. It can be adjusted up and down while riding and is very versatile. It offers good wind protection. I used the universal on my 06 Moto Guzzi Breva 1100, and fit eadily, quickly a well. Just be cacareful with the bottom clamps, turn your bars to lock and put that dide on, turn to other side and put that one on, to make sure it doesn't hit your tank, like it did mine!! Will this fit 1-1/4" handle bars? And if not, is there an adapter kit that will? BEST ANSWER: Don't know. My Airflow is specific to the Suzuki 650 VStrom. I might add that it works like a charm to eliminate helmet buffeting. 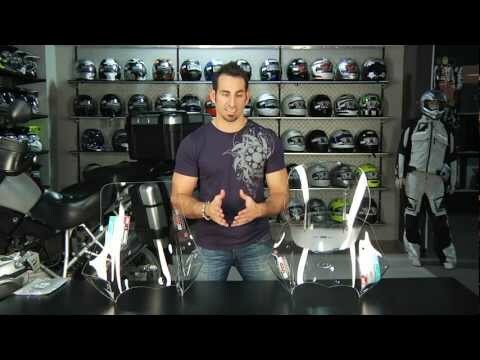 If this is the same givi screen that went on my 2012 v strom it doesn't attach to the handlebars at all. Will this fit 1 inch bars? BEST ANSWER: It is a frame mount windshield, so bars don't make any difference. At least that is the case for the BMW version that I have. I assume that is the same for other makes of bikes. I have a 2009 Kawasaki Vulcan 900 Custom and I am 6'3" I am a new rider and I just feel uncomfortable riding above 60mph because of the shakiness from the wind on the bike and my head. I am looking for a windshield high enough to deflect over my head and wide enough to cover my hands. Is this a good windshield to get or is there another one that you would recommend? I recently purchased this universal windscreen for my 2013 Yamaha FZ8. 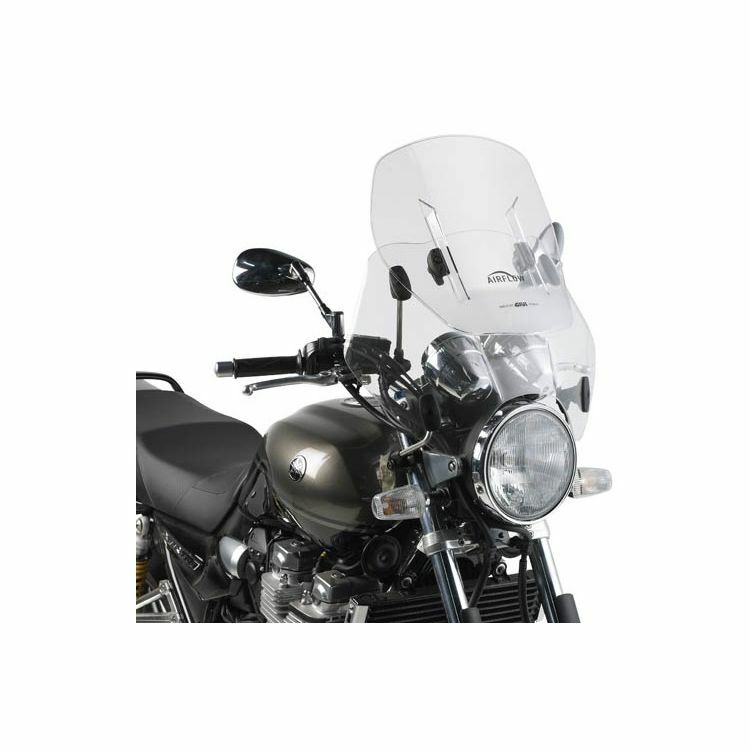 This windshield meets/exceeds the intended functionality, which is to deflect wind around the rider. This is a 2 piece system in which you can raise/lower the outer piece based on your height and posture on your bike. This windshield is much bigger than it looks and performs exceptionally well by re-directing the wind over my head and shoulders. You can also detach the outer piece and ride with the base piece. I recommend you enter your bike info in revzilla to see what revzilla offers for your bike both bike specific options and universal options. I would also youtube windscreens you're interested in and watch other riders who use the screen at high speeds and give their feedback. If need be, I can share some images of how this universal windscreen is mounted to my bike. I found out I was the first one to use this kit on a FZ8. I was a bit nervous it would not work but everything worked out fine.